Last Sunday saw a vicious terror attack in Jerusalem. Four young soldiers were killed when a Palestinian terrorist rammed them with a truck. Particularly distressing for me was the timing of the attack on Asara B’Tevet, a minor fast day which commemorates the beginning of the Babylonian siege of Jerusalem during the time of the First Temple. This siege would last more than three years and culminate with the Temple’s destruction on Tisha B’Av. In fact, the location where the terror attack occurred overlooks the Old City. If one had stood on that exact spot on that same day 2,500 years ago, one would have seen Nebuchadnezer’s army surrounding the city. Days of tragedy, like Asara B’Tevet, take on special meaning in the Jewish calendar. Rarely do they commemorate just one event. In that sense it feels like history is once again repeating itself. The prophet Zechariah, who lived during the building of the Second Temple, offers a promise to the Jewish people about the future of these days. He proclaimed that the minor fasts connected to the destruction of the Temple would, as part of the messianic redemption, be transformed from days of mourning to days of joy (Zechariah 8:19). For many religious Zionists the messianic era is already on the horizon. Rav Kook was the first to fully articulate a religious vision of the ways in which the Zionist enterprise would be the beginning of the messianic redemption. Zionism, even in its more secular varieties, has always had more than a little messianism in it. Though Theodore Herzl made sure not to travel around Israel on a donkey so as not give off the wrong impression of his efforts, he also spoke of having messianic dreams as a child. Of course, if the messianic era was truly upon us, we would no longer need to fast on days like Asara B’Tevet. I have long struggled with religious Zionists who believe such things because Jewish history has repeatedly demonstrated that messianism is always a messy business. How many lives have been lost because it was believed that the messianic redeemer had already arrived? How much suffering has been created because it was believed that certain actions will bring the messianic era into reality? The false messiah Shabtai Tzvi nearly tore apart the entire Jewish world, and the twentieth century was decimated by false secular messianisms such as Communism and Nazism. Judaism has traditionally resisted the idea that we can know with certainty when the redemption will begin because of the dangers inherent in such thinking. This is most obvious when reading last week’s parsha, Vayechi. When Yakov lies on his deathbed, he has ruach hakodesh, a prophetic ability to see into the future. In the midrash, the rabbis note that the parsha is stuma, closed (Bereshit Rabbah 96:1). This means that the parsha starts in the middle of a line as opposed to at a clear break. Yakov attempts to reveal to his sons exactly when the moshiach would come, but God hid it from him. The implied message from this midrash is that we are not meant to know exactly when the messianic age will unfold. We wait for it each day, but we do not have the ability to know when it will begin. That being said, waiting for moshiach can be far harder than we may realize especially in times of intense suffering. In his Letter to the oppressed Jews of Yemen, the Rambam harshly criticizes those who would attempt to calculate the specific date for when the moshiach will come. This is a position that is discussed in the Talmud and is consistent with the halachic ruling he himself codified in the Mishneh Torah (Laws of Kings 12:2). However, in that same letter, the Rambam also acknowledges that such attempts can grant profound hope in times of great difficulty. Despite his words of caution, he chose to share with the Jews of Yemen a tradition he received from his father about the coming of the moshiach within a short time. The fact is that Zionism cannot help but flirt with messianism because there may be no greater force in religious life than a belief that the moshiach’s arrival is immanent and that the world will be redeemed. However, the consequences of messianic thinking simply cannot be ignored. Perhaps the most dangerous false messianism in Jewish history was the movement that gathered around Bar Kochba. Born Shimon Bar Kosiba, he was anointed as moshiach by Rabbi Akiva and others and subsequently given the name Bar Kochba, the son of a star. Though it was not easy for the Jewish people before the revolt, after Bar Kochba’s armies were crushed, Jewish life became nearly unsustainable under Roman persecutions. While preparing the class [of which part of the book is based on], I imagined the massacre in the city of Beitar, the cries in the streets of Judea, and the degradation and suffering of my ancestors who lived through Hadrian’s evil decrees. I found myself growing increasingly angry with Rabbi Akiva for leading the entire nation to war and ruin. I don’t believe that the messianic era is upon us, and it is quite possible that the moshiach will not arrive in my lifetime. However, I an deeply appreciative of the insight that Rabbi Benny Lau was describing. My wife and I were most likely in that same park on that same Shabbat afternoon when Rabbi Benny Lau was walking to his class. We used to attend his synagogue and the park was just outside our apartment. That particular Shabbat fell just a couple of weeks after the birth of first child, and there was nothing more spiritually uplifting than the three of us to be together in that park in Jerusalem on a Shabbat afternoon surrounded by the old and young rejoicing in the holiness of the day. Zionism’s greatest achievement was that it brought the Jewish people back to their homeland and into history once more. More importantly, though Zionism did not eliminate the many enemies we face, it enabled us to take control of our destiny. It enabled us to ensure that the Jewish story will be told not by others but through the kind of state we build and the type of society that we create. It also happened that my wife and I were also once at the exact location where the four soldiers were killed. It is a stunningly beautiful spot on the Tayelet overlooking the Old City. We were there for a wedding of one of my wife’s good friends. When I feel overwhelmed at the loss of four young and beautiful Jewish children, I try to remember that despite the tragedies and the sadness, the potential for redemptive transformation always exists in Israel. There will be days of sadness and mourning, but the potential is in our hands to ensure that the bride and groom will rejoice in Jerusalem once more. In the same place where there was death, new life can and will flourish. 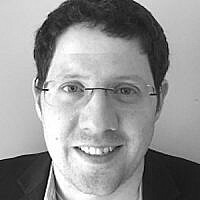 Rabbi Zachary Truboff recently made aliyah and moved with his family to Jerusalem. He is the director of the English speaking program at Bina L'Itim, a project of Yeshivat Siach Yitzchak and an educator for the Hartman Institute. For nearly a decade, he served as the rabbi of Cedar Sinai Syagogue in Cleveland, OH. He is an officer of the International Rabbinic Fellowship. He has a passion for using Jewish texts and ideas along with contemporary thought to address important issues of the day.